Andersen Track is scheduled to be replaced over the summer and be completed in time for the next academic year. The decision to renovate the track, which opened in 1990, was made over seven years ago. Director of Athletics and Chair of Physical Education John Biddiscombe explained that the average life expectancy of a track is about 13 years, while the current track has been used for over 20 years. Over time an outdoor track like Andersen develops bubbles that form under the surface. If these bubbles become large enough, they could cause a runner to trip, potentially during a race. “If you look at the track now, it looks like a patchwork quilt,” Biddiscombe said in reference to the many spots that have been filled in to prevent dangerous falls. 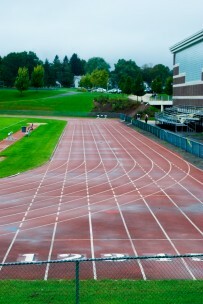 Roughly seven years ago, a renovation of the Andersen track was added to the University’s major maintenance list, a list of all planned projects and repairs around campus. Planning for the installation of the new track, including drawing plans and securing permits from the city of Middletown, began this summer to ensure that the track would be completed before students return next fall. Construction is scheduled to begin around May 15.